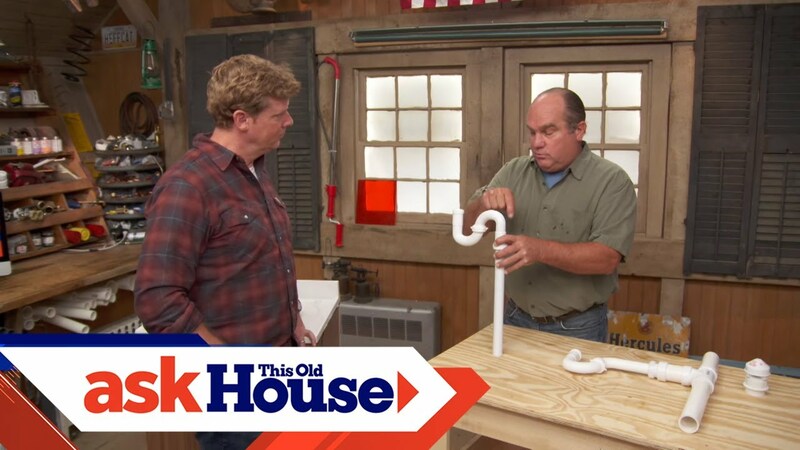 Ask This Old House plumbing and heating expert Richard Trethewey shows host Kevin O’Connor the proper way to ventilate a sink. 1. If a sink is gurgling after the toilet flushes, there’s probably a good chance the drain is not ventilated properly. 2. Replace whatever pipe fitting is at the drain past the P trap with a T fitting. Run pipe from the bottom of the T to the main drain line and then run pipe from the top of the T to the vent system of the house. This may require running a pipe to the roof if there isn’t a vent system. 3. In some areas, code may permit a retrofitted mechanical vent that can be placed on a pipe on top of the T instead of running it to the roof or vent system. Richard demonstrated a PVC P-trap with a mechanical vent that can be used where conventional venting is not an option. These and the materials required to install them can be found at home centers and plumbing supply stores.